Akrapovic Exhaust with cat delete question. I have an akrapovic slip on currently i would like to add the cat delete pipe for better sounds and so on do i need ecu flashing or a power commander? Last Edit: Aug 13, 2017 0:46:18 GMT -7 by RedAndBlack: Fixed typo in title, added a little more detail to title while at it. I would highly recommend a flash tune from 2 Wheel Dyno Works from this forum and Smog Block off plates. Agreead^^^ your engine will be running too lean and can eventually cause damage or failure to parts (often valves). Be smart, get it flashed. The basic slip on usually does not require a flash or power commander. But in my experience, any modification beyond just a slip on, and you should really consider getting one. For the reason mentioned above, that you can actually damage your engine, but also to make it run like the bike should. You're leaving a bit of power on the table and will be missing a smoother engine with better response and power curve if you don't do so. Welcome to the forum! You should post up in our New Members section with a little bit of detail about yourself and a picture of your baby! 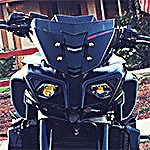 Skip the Power Commander, send your ECU to Two Wheel Dyno Works (look in the vendor forum) ...that's the hot ticket, and does so much more than a Power Commander is capable of (I had my FTECU done locally, but 2WDW seems to have the best map / tune for a send-away service). I also have the Akro with cat-elim, and LOVE the transformation. I have a new Yamaha MT-10SP with Akropovic fitted including the CAT delete. I was informed by Yamaha that the factory EC will autotune for this as it is a factory option. On the road, it is awesome, tune is fine. fuel economy is ok.
Bike has a lot more power - that is the question I was wondering about. Has anyone put one on the dyno and found out ? Not sure with the exhaust since I kept stock on my bike, not a fan of overly loud exhaust. But I had a custom dyno tune done and the bike made 8hp more and 4 ftlbs more at the wheel from just fueling. Added a sprint air filter and got another 2hp and smoother throttle and engine feel. But as the others have said, a tune to run with the new parts is a must. Without it you will most likely lose power due to it leaning out and it can cause damage. From what I remember stock map causes the air fuel to be around 15.5 to 1 under 9k rpm. That is already quite lean, add more air and its getting into danger zone. And as for the ecu automatically adjusting? Yes it does adjust but not to such extremes. It's adjustments are more for changes in air temp, fuel octane rating and elevation. Not for mass changes to exgaust flow or air intake.